Round precision mirrors are available in three different materials to meet various demanding applications where a high degree of wavefront integrity is critical. 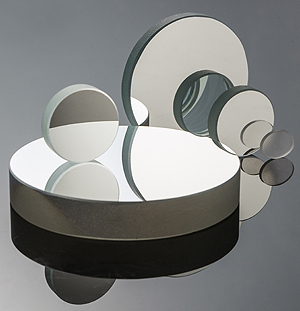 Our precision round mirrors are aluminum coated with a protective SiO overcoat. They are also available uncoated for use as windows or flats. Target Grade - made of low expansion borosilicate glass which provides low thermal expansion, high thermal resistance, excellent light transmission and impressive chemical durability. Interferometer Grade - made of synthetic fused silica which provides superior transmission characteristics, a high degree of purity, exceptional environmental durability, and a low coefficient of thermal expansion. ZERODUR® - made of a glass-ceramic material which is thermally more stable than fused silica. Please call for a prompt quote on your specifications.